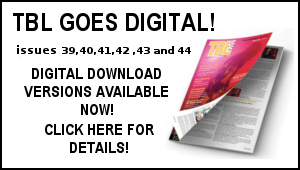 Tight But Loose » Blog Archive » Online Auction Bargains! 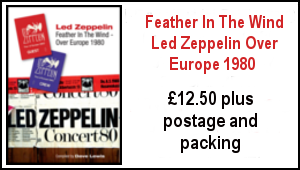 Time for a quick look at some resent Led Zeppelin on-line auction bargains! 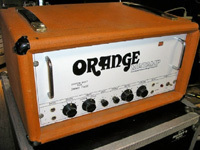 First up Jimmy Page’s custom Orange Matamp was sold in an eBay auction for $30000 last Friday. This was reported to be a 1971 Matamp amplifier, custom built and used and owned by Jimmy Page in the 70’s. A painting of Robert Plant that we featured a few months ago has raised £1,500 for Acorns Children’s Hospice. Painted by Sue Verity, of Tamworth and autographed by Robert, the portrait was snapped up by Led Zeppelin fan, Catharine Zelinski, living in Ontario, Canada. 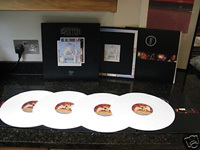 A limited edition white vinyl version of last years four LP version of The Song Remains The Same, sold last week on eBay for £678.78. Only 200 white vinyl editions were produced and only 100 were sold said the blurp, so what happened to the other 100? A copy of the first Led Zeppelin album with the famous Turquoise writing on cover, with 588171 inscribed on run out groove, the songs on label credited to superhype and with a very slight crease on cover inner sleeve, went for a staggering £800 on eBay last week. 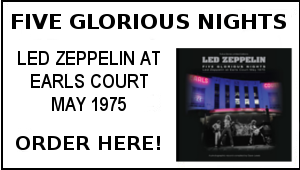 One real piece of Zepp history that failed to find the right bidder was an amazing commemorative mirror commissioned by Mel Bush in 1975 to commemorate that years Earls Court gigs. The mirror measured 32” by 24” and featured an exact copy of the classic Peter Grainey designed poster for the gigs featuring the Physical Rocket Train. It was stated that Mel commissioned only six of these mirrors, four were given to the individual members of the band, one Mel kept himself and the final one was due to given to Peter Grant, but, allegedly the promoter and manager fell out and Mel never gave Peter his and it’s this one that is for sale. It was brought from Mel Bush in 2008 and the new owner is selling it along with a letter of authenticity signed by Mel Bush. It failed to reach it asking price of £1999 and has been withdrawn for now. 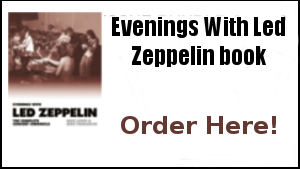 This is an incredible piece of Zeppelin history and no doubt will find a new owner soon. For some reason I have 2 copies of the Turquoise sleeve. Thats the problem – they came with no discs. I do not fancy my chances of finding the appropiate discs in ordinary copies of the Plum label Polydor with orange lettering.